Around 50,000 demonstrators marched through the streets of Cologne this afternoon to show their support for Turkish President Tayyip Erdogan. Waving the Turkish national flag, demonstrators held aloft pictures of Erdogan and placards reading ‘For Democracy, Against Putsch’ after a failed military coup earlier this month. 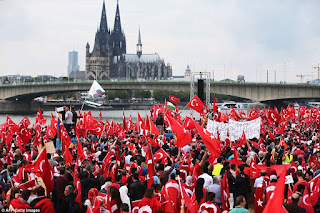 ‘We are here because our compatriots in Germany advocate democracy and are against the attempted military coup,’ Turkey’s sport and youth minister, Akif Cagatay Kilic, who attended the rally, told reporters. The demonstration became the focus of increasingly strained ties between Germany and Turkey after a decision by Germany’s top court on its eve prevented Erdogan from addressing the meeting via video-conference. ‘German Constitutional Court’s decision on the anti-coup rally in Cologne is an utter backsliding in freedom of speech and democracy,’ Turkey’s minister for EU affairs, Omer Celik, wrote in English on his official Twitter account….